Louisville, KY (March 8, 2018) – Kentucky Farm Bureau (KFB) members made their way to Frankfort this week to meet with their state legislators during the annual KFB Legislative Drive-In/Food Check-Out Day. Traditionally the event has taken place on two separate days; one reserved as an opportunity for KFB members to inform their respective legislators of the organization’s priority issues and any legislation they support; the other as a time to bring awareness to food costs in the state and across the country. The USDA’s Economic Research Service estimates that Americans, on average, spend about 7 percent of their incomes on food each year which means it would take four weeks to earn enough money to pay for a year’s supply of food. Supporting the rural secondary and county road aid programs and continuation of the 22.2% allocation of the state gasoline tax revenue for rural roads. Representative Jonathan Shell visited with some of his constituents who were participating in the Legislative Drive-In/Food Check-Out Day event. Shell, who is the House Majority Floor Leader, said the Drive-In is an excellent example of how the grassroots approach of bringing forth issues to lawmakers works. 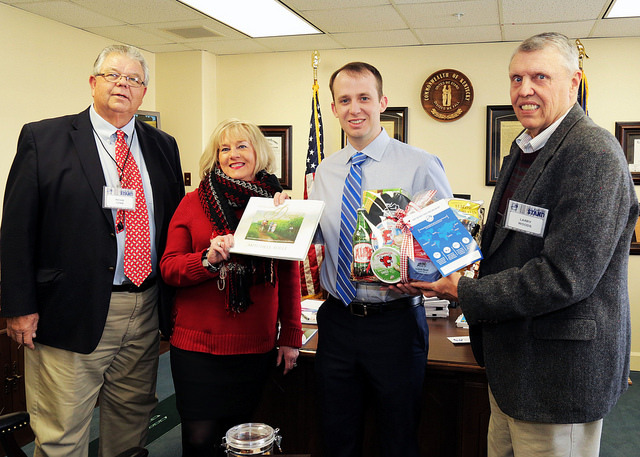 This year’s KFB Legislative Drive-In/Food Check-Out Day brought members representing over 85 counties to Frankfort with more than 140 food baskets delivered to lawmakers as well as Gov. Matt Bevin.